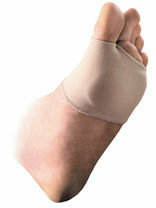 Gel Heel sleeve for protection of the heel area. Sold in packs of 1. 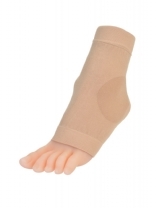 Soft skin heel sleeve ia a gel pad anatomically molded to the shape of the heel and occlusion has been shown to be beneficial for psoriasis and eczema. Pack of 1. 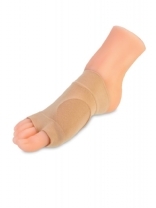 Two large discs of polymer gel molded on both medial and lateral malleolar reducing pressure and friction to the area and is an effective way to protect ankles from sports boot. Pack of 1. Sold in packs of 1. 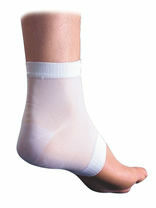 The Malleolar Sleeve provides mild compression to help reduce ankle swelling in and around the ankle, cushions and protects the ankle from pressure. 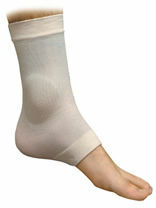 With 2 gel pads on either side to protect the ankles and moisturise the skin while cushioning the area. 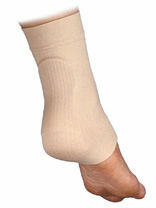 Surgical grade elastic sleeve with a gel pad that covers all five metatarsal heads and serves as a soft tissue supplement to fat pad atrophy. 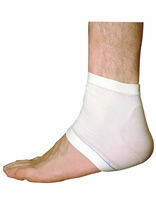 Available as covered gel or ucovered gel, pack of 1. 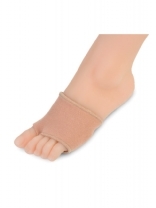 Specially designed gel heel sleeves which provide excellent solutions for pressure sore prevention and the treatment of heel fissures.